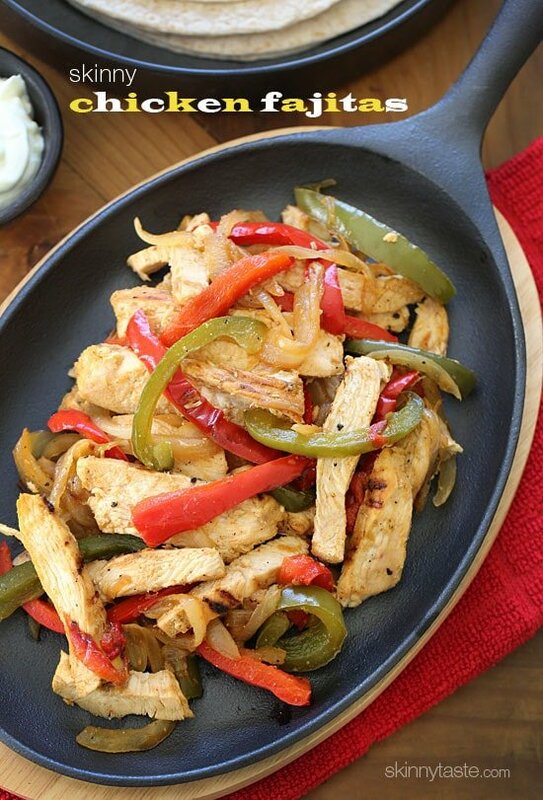 Skinny Chicken Fajitas made with lean strips of chicken breast, bell peppers and onions served sizzling hot with warm tortillas and shredded cheese. If this is your idea of delicious, you are not alone! My husband Tommy is a creature of habit; anytime we go out for Mexican he always orders chicken fajitas. In fact when we went to Mexico a few years ago, he may have ordered them almost every night! I find that amusing because I get really bored of eating the same thing twice, and tend to always take a chance and try something completely new to me. But chicken fajitas are a regular in my home, we make them at least once a month and the whole family enjoys them. My younger daughter Madison likes her bell peppers raw, so I chop some up and just set them aside for her and cut up the chicken. You can make the whole thing outside on the grill using a cast iron skillet to cook the peppers and onions as we usually do in the summer, or you can cook this indoors in a skillet. Enjoy! 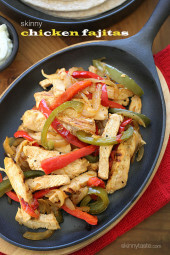 Lean strips of chicken breast, bell peppers and onions served sizzling hot with warm tortillas and shredded cheese. If this is your idea of delicious, you are not alone! Marinate the chicken with lime juice, and season with chile powder, salt, pepper, garlic powder and cumin. Season vegetables with salt and pepper and toss with olive oil. To grill the onions and peppers outside on the grill, use a cast iron skillet and grill covered over medium heat until tender, about 15 minutes. Or, to cook them indoors, you can use a large skillet on the stove over medium heat for 16 to 18 minutes, covered until the onions and peppers are soft. Heat an outdoor grill or indoor grill pan over medium heat; grill chicken until cooked through, about 8 minutes on each side. Transfer to a cutting board when done and cut into strips. Once cooked, combine with the peppers and onions. Serve immediately with warmed tortillas, cheese and toppings. Thanks for sharing the recipe . I really apreciate it. We veganized this, using Morningstar Farms strips instead of chicken, and barbecued it, keeping the lid on the grill to make it extra smokey. We also used Trader Joe’s corn/flour tortillas to minimize the points. The fajitas were a huge hit, and even my kids loved them. Definitely will be making them again–thanks! Skinny Taste,Once again you have mastered another recipe!!!!! I have coconut curried my husband so much, he was ready for something new and this hit the spot!!! I added some fresh corn with cotija and some homemade salsa.. Who needs to go out????!! I have a question. This is listed as 4 Freestyle points, but when I put it in the recipe calculator, it comes out at 11 Freestyle points. I’m wondering where I’ve gone wrong. 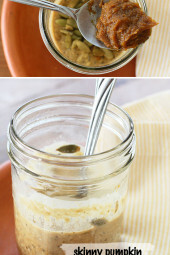 My wife and I super love this recipe, it’s a staple for us in the summer! Hi Shane. The SmartPoints® calculator isn’t meant for recipes and will often give you the wrong points (usually higher) because it’s counting 0 points foods such as eggs, chicken, fruits and vegetables. So if you see a recipe with a SmartPoints® value that’s different from what the calculator tells you, that is why. Quick question…do your counts count in the cheese and tortillas? or is it just the chicken and peppers? Thank you! Love this recipe!! We LOVE these! This is a weekly staple in our home and my husband (who’s Mexican) says this is better than he’s ever had homemade or in a restaurant. Thank you for this recipe! Made these today. They were yummmy! I made a simple pico de gallo with tomatoes, onion, cilantro and lemon juice and added it with the cheese and sour cream. Thanks Gina! Any ideas if you are trying to cut the carbs on what to serve with these? I make them over a big salad with avocado, it’s great! Hi! Wondering what the calorie count is without tortillas as those vary by brand. I only get the correct calorie count if I use four tortillas instead of eight. When I calculate 8 low carb tortillas on MyFitness Pal at 80/90 calories each for the serving size for four, it’s more like 359 calories. Two tortillas alone would be about 180 calories so I don’t know how all the other ingredients only amount to another 119 calories. I’m confused. Different brands will have different calculations. Sounds great and I will definitely try this. Could work with steak too! Found this recipe, bought all of the ingredients, and I've been looking forward to it ALL DAY! And I was not let down 😉 Absolutey delicious! Gina, I used the recipe builder and got 7pp with the cheese (but not the sour cream or guac). What are you including to get to 8? Superb chicken recipe. I love it because it is one of the best healthy dinner recipes for me all the time. a regular in the home but you eat it once a month? does that make snese? These were AMAZING! I used a big piece of romaine lettuce for my tortilla. PERFECT! Love your recipes!! Thank you! We are trying this meal today for lunch. The chicken tastes so good and its really juicy too!! We plan to make it again! Thank you for sharing!! I made this this week and it was delicious. I didn't use the tortilla shells I didn't have any in stock in my cupboard, so I had it over rice excellent. I will try it with tortilla shells next. But over rice was a good change too. Thank for the easy to do recipe. Made this this evening and it was awesome. I didn't even use the tortilla shells because the flavor is so great that I didn't think it needed anything but a small amount of cheese. I was introduced to your site 4 days ago and have already made 3 recipes. THANK YOU for sharing such great recipes with the world! Gina – if I am going to measure out a serving of the chicken/peppers on my food scale, is it safe to assume 1 serving = 8oz when weighed? This recipe was a crowd pleaser in my house tonight. My girls love raw peppers and finally started eating n them cooked. Added some of the extra spices to the veggies too. I made these last night and they turned out wonderfully. Your marinade rocks my socks. This is awesome! Question..does that calorie count include the toppings? Tried this last night, just wonderful. We added some salsa and light sour cream so the calories were still down. Besides the wonderful flavor, we actually were full with the serving size of two. Bravo!! Last but not least, found some tortillas that were only 60 calories each, gotta love that! Thanks!! I saw someone asked this already but didn't see a response. Is chili powder the same as chile powder? Gina – This chicken was great! Didn't have limes but worked great with lemons. For a lower calorie idea, I made everything and put it on top of butter lettuce, added salsa as a dressing and crushed Food Should Taste Good multigrain chips on top. DELISH! Made this over the weekend and it was a huge hit in my house! I will definitely be making this again! I just had this for my Mother's Day lunch – fabulous! It was better than if we'd went out to eat instead. Thanks, Gina! I made this last night and it was so delicious! We had it with a bit of your southwestern black bean salad on the side. We didn't have a cast iron skillet for the bbq, so my husband put the veggies in tin foil and made them a little pouch to steam. They turned out fantastic! 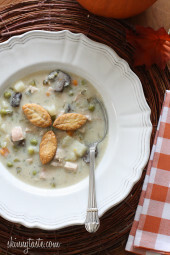 This is so simple and delicious – definitely going to be one of our regular meals. Thanks again Gina. As always, your recipes are fantastic! I love Chiken fajitas! Are my favourite one! I'll try them as soon as possible!!! Your kitchen must be over flowing with cute little kitchen accessories! Loved it! All of your recipes are 5 stars! I live by your recipes, and tell everyone to try them! Do you by chance have the nutrition for this without the tortillas factored in? We don't have a trader joes near so will be using different tortillas and I would like the option of just eating the filling alone or as a salad topper. Thanks so much!! We love your blog and invite you to join us. Your blog will be in the top rank of Recipesup! blogs. You can upload your recipes only with a click! Oh man, fajitas are my favorite! Can't wait to try these out! Thanks for the skinny tip! Plain Greek yogurt makes a yummy, healthier substitute for sour cream. I find it too tangy for my taste, but yes, I know a lot of people like to use yogurt. It's all optional. Me too..but the Kroger brand (From Smith's in my area) 0% Fat Greek Yogurt is awesome and creamy, not tangy like the other ones..which is nice as it is the generic brand and I like it better than the name brands. I LOVE that the cheese is not optional! So to be clear, the calorie counts and points include the cheese? That would be super! Le tue ricette sono sempre appetitose e fanno venire voglia di porvarle. Complimenti, sei davvero bravissima!!! My 3 year old is the same way with peppers, so I always set aside some raw strips for her, too 🙂 It's funny how when you cook you have to remember to deconstruct some meals so the kiddos will eat it. I almost order the same thing when we go out for Mexican food too: steak tacos! Although we just discovered that a new Mexican restaurant in town has pulled pork tacos that are just as good as their steak, so I may be changing my order… And I love the way your daughter thinks – raw red bell peppers are my favorite vegetable! Quick question: What's the difference between ordinary chili powder and Mexican chili powder? Or are they they same thing? you have the BEST recipes!! love fajitas, and will be trying this out soon! thanks for sharing!! Yum! I love how you can eat two of them for just 300 calories. Perfect for when you don't want too heavy of a dinner! 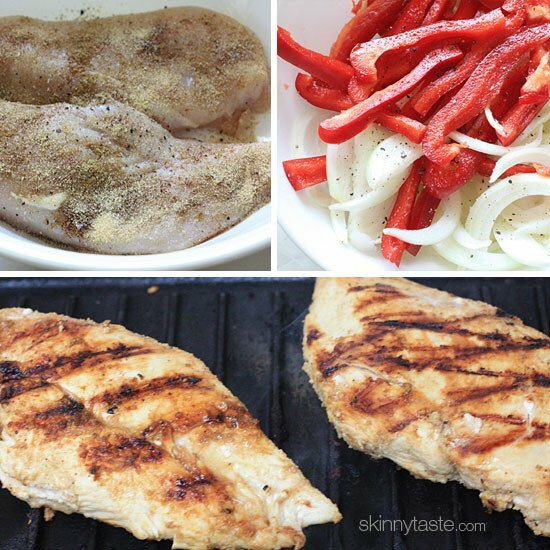 Such a scrumptious, easy recipe for fajitas – I love it! These look so delicious, Gina! I love fajitas! with margaritas! I have been trying to kick the habit of bottled marinades and this is perfect for that! Thanks for the simple marinade/rub. 🙂 We have fajitas all the time, year round. I even freeze a pepper/onion mix for when the peppers are out of season. If you are watching carbs, you can make a 'bare' fajita by serving the above over quinoa instead of using a tortilla. YUM! great, I didn't even know they sold bottle marinades for fajitas! Thank you thank you thank you! This was delicious and we'll be adding it to our family's summer lineup for sure! 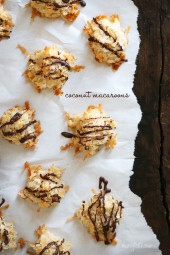 I made these tonight and they were delish! I did modify it to my taste, but the marinade is awesome! Just founds your website. Very impressed with recipes. Keep them coming! PLEASE, PLEASE — I LOVE THE PICTURES – DO NOT ELIMINATE THEM!!! Just made this tonight and it was fantastic! What is the calorie count if I eat this without a tortilla? Look at the package of your tortillas for the calorie count and then subtract it. I made Chicken Fajitas from this recipe and wow never made them so good before!! So easy to! I made this tonight. I admit, I was skeptical on whether it would have enough flavor. I make fajitas a lot but usually just buy the seasoning packet and make it that way. I've never made it without. I used chicken tenderloins, because it's all I had and ended up marinating it for a couple hours before dinner time finally rolled around. It had great flavor. The chicken was tender and moist. And the veggies were so good! I've never thought to grill veggies on my Foreman grill like that. The flavors were so much better than making them in a pan. Another great recipe, thank you! made this tonight…so great! this was actually my first skinny taste i tried making! Whats the exact mesurements for each serving size? Like 1 cup per serving? I'm so excited to make this… I am wondering though if it would be good using fresh garlic instead of garlic powder? How much would you use in replacement? I plan to try this out. Thanks for sharing! WOW! We just made and devoured this meal. I also just ordered basically the same thing from Chili's last week and this made me realize how eating fresh and organic is SO important to our bodies. This is one of the freshest meals that I've had aside from juicing. Thank you Gina! I was wondering if there is something I could use instead of onions and bell peppers. I suffer from migrains and they are both triggers for me. In most recipes I can just omit them but in this case that leaves me with just chicken. Which is fine but I have always wanted to make this with something else for more flavor and texture. Chicken fajits are made with onions and bell peppers. If you can't eat them, then you can't eat fajitas. Stop with the stupid requests. wow, so nice of you, not everyone thinks the same way. I would try maybe zucchini julienned, mushrooms, fajita can be interpreted as more the style of cooking the meat and serving it in tortilla's than what is actually in it. Be creative and put together a combo that sounds good to you. Ahem…Cindy dear, the comment that you just blasted is from over a year ago. Not sure she is going to come back and see your negative comment. She could make a wrap with the chicken using the lime juice and spices and sub other veg. Not everyone is an experienced cook on this site. Take it easy. This was so good! I recently moved to Nigeria from Texas and am so excited to find WW friendly recipes that are from scratch and don't have to use processed ingredients. Thank you so much! I just have a few questions. First, can I omit the poblano chile. Second, the carbs are very high, are these good carbs or bad carbs. Lastly, do you have recipes that I can use for two people? About 30 minutes would do. Hi Gina. This looks so good!! How long should I marinade the chicken? Thanks! Bell peppers would be fine. Hi Gina, Was wondering what could be subsituted for the poblano chile. I can not find it in the stores? Thank you for such AWESOME recipes! Poblano peppers are also in grocery stories (like Safeway) as Pasilla peppers. I love these at REsturantes so i am super excited to try this at home!! Can not wait 🙂 yummy yummy yummy! Chicken enchiladas are one of my favorites! Thanks for your fantastic recipes Gina! We'll be making these tonight. When you get a chance, I'd love to see the nutritional info to recalculate it. Where do you live? It's hard for me to know what is not available to you in your area unless you tell me. You can also find a lot of ingredients for sale online. please remember that some of us live in places that the stores don't have some of the ingredients. Maybe you could be a substitute along side. oh my goodness, stop with the silly complaints already. same ere i have the same problm as i Live in Pakistan.. so there few of the ingredients r not available but the dish sounds deliciouss. I just go online and order – Amazon is great for ingredients you can’t get regionally. I order ingredients frequently and many times shipping is free and they always come quickly. Many times they are much cheaper than stores also, like vanilla beans. I ordered some items on Sunday and they were here by tuesday. Hi the recipe sounds really tasty and I would like to try it but as I'm doing S/W I wondered how it would translate, I wouldn't want to jeopardize my progress. I've been doing WeightWatchers for 7 months now and got in a rut of eating the same things over and over again – tried this last week and oh my God, it was so delicious. Thanks for posting all these great recipes! I love tortillas. They are a staple when the weather warms up. love your blog, was telling my sis who is doing weight watchers ad I’m sending her the link right now, she is so exited. Thank you for sharing your recipes.